It’s predicted that this year tablets will outsell PCs for the first time, a clear sign that Internet usage is moving towards a more portable and accessible format. Smartphones are showing a similar upswing, with a recent Pew Research Center study showing that 56% of Americans are currently using a smartphone. Both tablets and smartphones are small devices with a big job: display all of the information on the Internet in a usable manner on a small screen: you could be viewing content on a screen anywhere from 3.5″ to 10″. Compared to a laptop’s 15″ screen or a PC’s 23″ monitor, that’s not a lot of room. All of that information needs to be converted into a format that works well with a small display, and there are specialized tools to do that. An “app” is a buzzword you’re hearing left and right, but I was surprised at how many people don’t actually know what an app does. An app , short for “application”, is a specialized mini-program that allows information from the Internet to be presented on a tablet or smartphone in a friendly way, and often includes enhanced features. For instance, if you wanted to see some news on your PC, you might head over to CNN.com and read the headlines. However, if you did that on a tablet, you may find that same site is a bit difficult to read. Instead of going to the CNN website, you could go to your tablet’s Apps Store (example: iTunes or Google Play), and install CNN’s news app. By using the app, not only is CNN’s content easier to read and easier to navigate, you also get features like breaking news alerts, better video playback, and more. The app makes CNN’s content easier to view and takes full advantage of your device’s capabilities. Nearly all web services have apps that you can install, and many times they’re free of charge. Instead of trying to use your bank’s website on your smartphone screen, try installing their app so you can use larger controls and specialized tools to do your banking. Sites like YouTube and Facebook also work better in their app versions than going directly to the website on your mobile device. Many of TOAST.net’s service work with apps as well, allowing you to maximize the capability of your tablet and smartphone. If you have a TOAST.net or Google-based email account, you can actually set the account up on your tablet or phone to receive new message notifications as well as synchronize your contacts and calendar with your PC, webmail, and any other mobile devices. This is an incredibly powerful feature and is very easy to set up. Google Phone/Tablet Users: Follow these steps. Apple Phone/Tablet Users: Follow these steps. If you’re using a traditional (non-Google) email account, you can set your phone’s standard email app to receive your messages. Some business-class email accounts are even able to sync contacts and calendar information. TOAST.net residential and business customers can get instructions for their specific account type using the TOAST.net Email Wizard. Google Phone/Tablet Users: Open the Google+ App, then Touch Menu > Settings > Auto Backup > Toggle On. Apple Phone/Tablet Users: Touch menu > gear icon > Camera and Photos > Auto Backup > Toggle On. 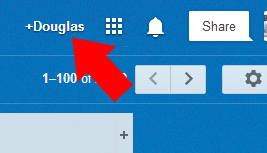 On your Google email screen, click your name+ in the upper right corner to open your Google+ account. 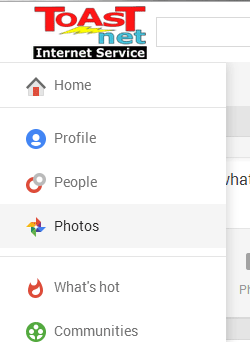 If you’ve never used Google+ before, you might have to fill in some brief account information before starting the service. Anytime you take a photo or video on your mobile device, it should eventually appear on your Google+ account. Click the “Home” button in the upper left corner of your screen and select “Photos”. From here, you can easily create albums, organize, delete, and share your content with others. Google Drive allows you to create, share, edit, and sync documents directly on your mobile device, and once you create a document, it’s also available on your PC or other devices. Besides the obvious “work from anywhere” benefit, this app is handy for creating lists, instructions, or other quick notes. 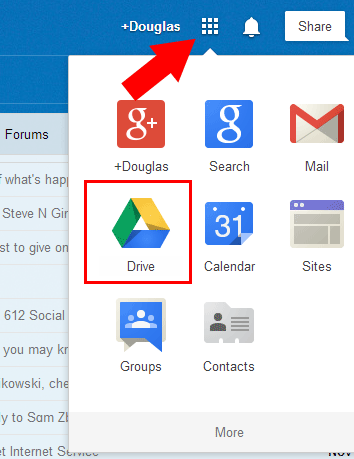 Install the Google Drive app (iTunes or Google Play), and anything you create on your phone will also be accessible in your Google-based email account under the “Apps” icon. Any documents in your Drive can also be easily emailed and shared with others, making collaboration easy. These are only a few of the apps that optimize your portable devices and make them more usable. Feel free to list your own favorites!